I read an online wedding board recently where someone had posted a rather relevant question: do guests travelling to a destination wedding also give gifts? Which just about sums up the main issue when it comes to getting married in a far off clime – the expense for the guests. It’s one thing getting married in another city, where a few family members and friends you’ve made whilst travelling abroad must foot the bill to attend. But when you choose to marry at a totally unrelated address simply because you like the idea, and your entire wedding retinue needs to travel – that is quite another story. 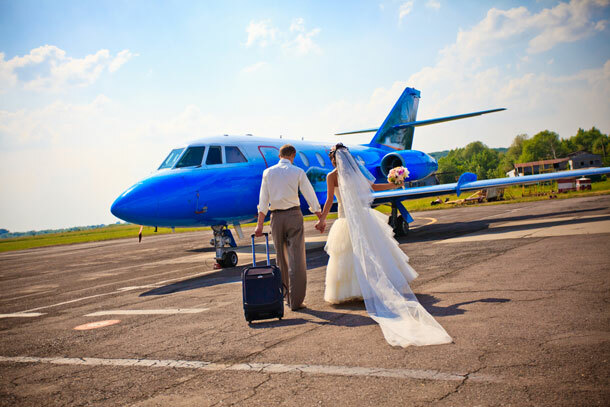 Yet destination weddings are extremely popular – certainly amongst the jet setting crowd and celebrities. Just what defines a destination wedding? Perhaps the contention rests in the different ideas that define them. The accepted version of a destination wedding is something of an elopement: the couple, and a handful of friends and family, travel to the destination where the ceremony takes place. This is followed by the honeymoon, and the ‘reception’, or party, takes place on their return. And then there are destination weddings that happen because your other half happens to come from there. You’re from Johannesburg and your partner’s enormous family lives in Sweden. You’re marrying in Uppsala, and your family are having kittens about this upset.